This salad is so satisfying. Everything is grated finely, making the texture so delicate and pleasant that it's hard not to overeat. It's a keeper. It's not just a keeper, but it's a "sharer." You might as well just print a bunch of recipe copies so you are armed when you take this salad to your next party. People will ask for the recipe. Add whole unpeeled potatoes and carrots to a medium pot and fill with water. Bring to a light boil and cook for about 30 minutes, or until knife pierces them smoothly. Don’t let them get too soft. Let cool to room temp then refrigerate. Cold veggies grate best. Peel veggies just before grating. In a separate pot put eggs into cold water. Click here for a quick tutorial on perfect hard boiled eggs. Once eggs are cooled, peel and cut eggs in half separate whites from yolks. Mix 1 cup mayo with 1/4 cup light olive oil and stir together until well blended and smooth. Transfer mixture to a zip-loc bag and cut a tiny hole in the corner of the bag. You will be squeezing the mayo in thin strips over the salad layers. Mix drained tuna with 2 Tbsp mayo and a sprinkling of pepper. Spread tuna mixture over the bottom of a glass baking dish (9x9 square, 9x11 rectangular, or in a trifle dish). Drizzle a light layer of mayo over the tuna. Finely grate the egg whites evenly over the tuna and season lightly with salt. Drizzle a light layer of mayo over the top. Finely grate carrot evenly over the salad, sprinkle lightly with salt and drizzle on another thin layer of mayo. Bring a small pot of water to a boil. Finely chop onion and boil for 5 minutes. Drain well and rinse with cold water to cool it faster. Spread onion evenly over the salad and top with a thin layer of mayo. Finely grate potatoes evenly over the salad, season with salt and pepper and drizzle on remaining mayo. Spread mayo gently and evenly over the top with a spatula. 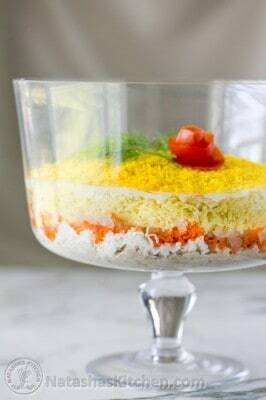 Top with finely grated egg yolk along with fresh dill and tomato roses for garnish if using. Liliana even shared an easy tutorial for how to make the roses here. *Tip: I like to pre-cook my carrots, potatoes and eggs so there's no waiting for them to cool down. You can even cook them 1-2 days ahead of time, let the cool to room temp then cover with plastic wrap and refrigerate until ready to use. Then it's really easy peasy and read for quick assembly.